© Richard Khanlian/New Mexico Tourism Dept. Santa Fe, New Mexico -- nicknamed "The City Different" -- is an American travel destination with its own distinctive personality. Santa Fe looks and feels like nowhere else, and furnishes as close to a foreign vacation as you can get without crossing the border. 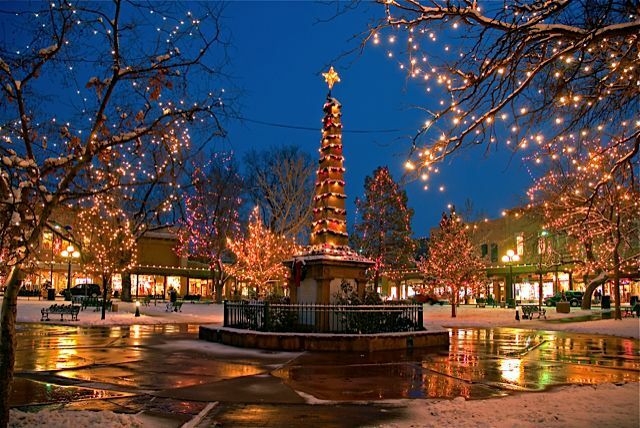 • These days, Santa Fe is a luxury travel paradise. • Climate: High desert (7000 feet in altitude) with four distinct seasons: long, cold winter; short, raw spring; warm summer with refreshing daily rain; crisp, colorful fall. Santa Fe's heritage is a heady mix. Within moments, visitors you know that "the City Different" -- the U.S.'s oldest state capital -- is indeed one of a kind. And Santa Fe looks like nowhere else in the world. Its vivid landscape is a work of art, vibrant with orange adobe, silver-green sage, a brilliant azure sky, and patches of bright-yellow chamisa blossoms. Santa Fe's glorious landscape inspires outdoor adventures and artistry of all kinds. Santa Fe is filled with artists…and visitors taking creative workshops in art, writing, cooking, performance, and filmmaking, courtesy of DIY Santa Fe's Creative Tourism programs. • Santa Fe resembles a Georgia O'Keeffe landscape. She painted what she saw. The colors of the landscape and the endless sky are really that intense. Galleries galore on Canyon Road, a mile-long art market along an 18th-century street. Superlative restaurants and bars, among the most dynamic and innovative in the world.